Occupying the 9th floor of the Museum of Arts and Design at 2 Columbus Circle, is the brand new 132 cover restaurant by Michael Weinstein of Ark Restaurants and Brian Saltzman. Weinstien and Saltzman seem to be approaching the design like that of a collector (it’s the MAD museum after-all) commissioning a diverse mix of designers, artists and architects to work on the décor. The interior architecture is by LLC Schefer Design, the ribbon-like rose gold communal table and hostess stands are by Philip Michael Wolfson, sofas and banquets by Vladimir Kagan, and what is getting us all in a flutter is Johanna Grawunder’s lighting installation. 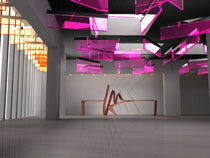 In the main dining room pink acrylic panels containing LED lighting are suspended all over the ceiling like mobiles. Along the ‘corridor’ with its views over Central Park (created when architect Brad Cloepfil reclad Edward Durell’s 1964 lollipop columned building), Grawunder has suspended orange boxes in the same architectural fashion. The panels, specially produced by Flos in Italy, have mirrored edges which shoot the coloured light back up again, and white spots mitigated amongst the panels ensure that Chef Brady Duhame’s ‘seasonal, healthful and clean’ updated comfort food looks as good as it tastes.